Limited to 30 participants total. Only $60.00 for the whole weekend! The weekend package is not available to be split up by day. 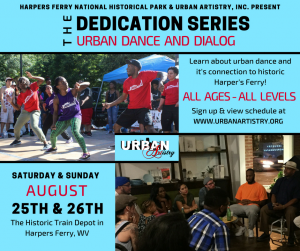 Come to historical Harpers Ferry, West Virginia, to explore how the people, music, and movement of our past currently reside in today’s urban dance landscape through the tradition bearers of Urban Artistry, Inc. (www.urbanartistry.org). Working through the lens of an interdisciplinary urban dance education, students will become advocates of cultural preservation and artistic innovation as they discover dance, vocal, and instrumental traditions that have endured through America’s history of slavery, Civil War, and Civil Rights. Urban Artistry, Inc., is an internationally recognized 501(c)3 non-profit organization dedicated to the performance and preservation of art forms inspired by the urban experience. Serving as cultural ambassadors for communities that are often unsung, the group fulfills their mission through effective collaborations that support artists’ past, present, and future. New learners, experienced dancers, and musicians of all skill levels are invited to become part of a growing community that inclusively seeks to understand the American experience through music, dance, and dialogue. Each session will include discussions about social context, historical references, and cultural exchange. Official parking for this event is at the Harpers Ferry Visitor Center, located off of route 340 at Shoreline Drive. Park your vehicle, walk to the park shuttle, board the shuttle bus that will take you to lower town. Exit the park shuttle and take the 5-minute walk (4 blocks) to the park’s historic train station on Potomac Street. Park shuttles run from 9AM to 5:45PM, every 15 minutes. All of the weekend’s events will take place in the lower part of town. Officially registered participants are not charged an entrance fee to the park because registered participants are providing park visitors an opportunity to experience the park’s diverse history through dance and music. The second day builds on the lessons from the first. INTRO TO POPPING/BOOGALOO (sometimes also spelled as poppin’ or referred to as pop n’ lock, pop and lock, or even poplocking) is a dance that has its roots in Oakland, CA during the 1960’s. The dance was born out of a time of social and political awareness. Traditionally, it was done to funk and soul music as a solo and group dance, pulling from many resources like James Brown, vernacular jazz, tap, singing group routines, science-fiction films and cartoons. These various influences allowed dancers to be original in their presentation. A “boogaloo” is a dancer that understands a variety of sub-styles. This workshop will include basic movements and historical underpinnings of popping and boogalooing, such as posing, popping, twisto-flex, waving, isolations, robotics, gliding, tutting, and more. INTRO TO HIP HOP DANCE is an introductory level workshop geared for those interested in learning the basic movements and historical underpinnings of freestyle hip hop dance culture. This class will offer movement foundations that span the classic social dances (such as the running man, wop, and cabbage patch), isolations and body control, and variety of bounces, rocks, and digs to establish various grooves and rhythm patterns. INTRO TO HOUSE DANCE is an introductory level workshop geared for those who are interested in learning the basic movements and historical underpinnings of the House dance experience. Students will build a working understanding of foundational house dance movements such as jacking, footwork, and floorwork. Furthermore students will garner an understanding of participating, learning, and growing in the cypher as it pertains to the constant evolution and relevance of house dance culture. Participation in this class will equip students with the foundational techniques and vocabulary that lead to confidence and intention in performance, battle, and cypher settings. Junious “House” Brickhouse is an internationally established educator, choreographer and cultural preservationist with over 30 years of experience in Urban Dance Culture. Born in Virginia Beach, VA, his dance training began at family gatherings dancing the funk styles of the era. Growing up, he sought out all the learning opportunities available to him, from community centers to parking lots, where young people were teaching each other and building communities around urban dance forms. Early on, he established himself as a leader and mentor in those communities, serving to educate and guide others. At age 18, Junious embarked on an over 21-year career as a Logistics Professional in the U.S. Army and later as a Department of Defense contractor. Throughout his time in various international assignments, Junious developed both a military and dance career, eventually rising to positions of leadership and responsibility in both areas. As the Founding Executive Director of Urban Artistry Inc. (www.urbanartistry.org), Junious has inspired and created a movement of artists dedicated to the preservation of urban dance culture, specifically within communities of practice. 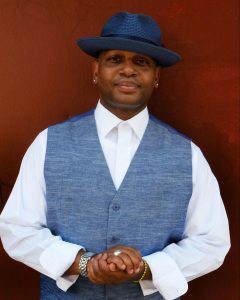 As Urban Artistry’s Executive Director, Junious produces projects such as The International Soul Society Festival, The Preservatory and the UA Digital Archives to encourage other artists to research and document these tradition bearers and their stories. As a scholar/practitioner, Junious teaches at colleges and universities, using an experiential approach to teaching, Movement of the African American South, Hip Hop as well as urban dance movement and the cultural context from which it evolves. As the Co-Director with Next Level, an initiative sponsored by the U.S. Department of State Bureau of Educational and Cultural Affairs in association with the Department of Music at the University of North Carolina at Chapel Hill and the Meridian International Center for Cultural Diplomacy, Junious works tirelessly to promote international cultural exchange in underserved communities, conflict transformation and entrepreneurial skill building through hip-hop music and dance. A citizen folklorist, Junious also conducts independent research into those cultural traditions whose influence is reflected in urban dance culture. 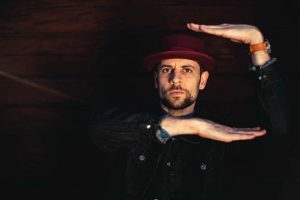 From ring shouts and acoustic county blues to hip hop, understanding the nature and meaning of these art forms and their influences, is what motivates this artist. Ryan “Future” Webb is the Education Director for Urban Artistry Inc., a cultural ambassador for multiple forms of Urban Dance, and a community leader within the global Urban Dance scene. Mentoring all ages, creating curriculum, conducting dance research, cultural exchange, battling, performing, lecturing, community building, preservation, and innovation are some of the foundations of his work. Ryan’s dance disciplines and expertise are in Boogaloo/Popping, Memphis Jookin, and London Locking. Mentored by Rashaad Pearson and Junious Brickhouse, his dance lineage and influence also includes gentleman such as Damon Frost, Steen Koerner, Thomas Herodt, Lock Smith, and Dr. Rico. Taught to be 3-dimensional, culturally driven, and fearless as an artist; Ryan has innovated and inspired others in multiple styles of movement such as Tutting, Popping Ground Dance, Memphis Jookin, Strutting, Dance Fusion, and Routine styles. Throughout his career as a dance professional, his art has brought him to various countries such as Korea, Japan, Switzerland, Singapore, Taiwan, Sweden, France, England, Germany, Canada, Poland, Netherlands, Belgium, Norway, Denmark, Finland, and all over the United States. Maren Cummings is an elementary school teacher, youth development advocate, and dancer with a passion for integrating arts and education. 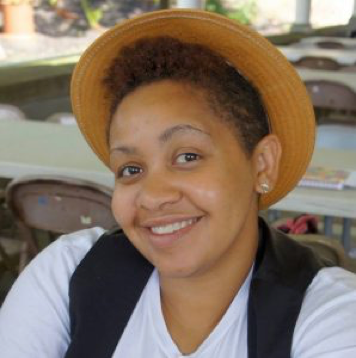 She has a Masters in Women’s Studies and her work as on the Operations team for Urban Artistry has included experience in managing an Artist in Residency program, assisting in performance production, and writing arts grant proposals. She joined Urban Artistry in 2008, and has trained in urban styles of dance including Hip Hop, House and Waacking, building on her foundation in West African dance. She is excited about combining her passion for youth leadership development and arts education within underserved communities. Greg Adams is an archivist, ethnomusicologist, and musician. He currently serves as Assistant Archivist at the Smithsonian Center for Folklife and Cultural Heritage in Washington, D.C. He holds a B.A. in music history and graduate degrees in library science and ethnomusicology. 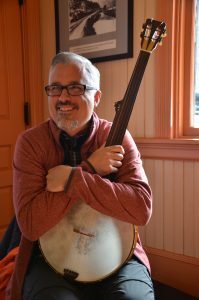 Greg’s musical interests are grounded in critical heritage research and programming focused on the multicultural history of the banjo. Highlights of his research as a private citizen include fieldwork in West Africa (2006, 2008), developing a work plan for maintaining data about banjo-related material culture through an NEH Digital Humanities Start-Up Grant (2009), and working with banjo scholars Bob Winans and Pete Ross as guest curators for the 2014 Baltimore Museum of Industry exhibit Making Music: The Banjo in Baltimore and Beyond.